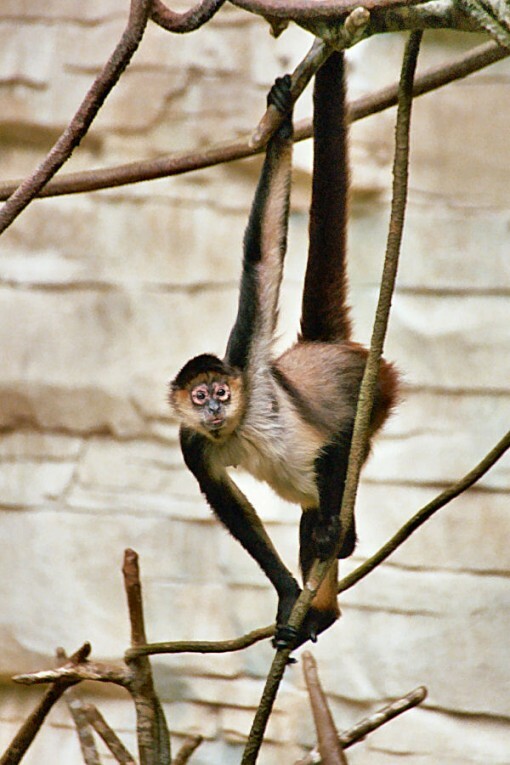 The spider monkey, a typical platyrrhine. (Image by Lea Maimone, via Wikimedia Commons. “Geoffroy’s Spider Monkey [Ateles geoffroyi].” Used under CC BY-SA 2.5 license.). Monkeys are such fixtures of the jungles of Central and South America that we think of them as a permanent part of the landscape. But they are not. Only three groups of mammals formed the “Old Guard” that lived in South America since the end of the Age of Dinosaurs: the carnivorous marsupials; the sloths, anteaters, armadillos and their kin; and the native hoofed mammals. Yet monkeys are among the most abundant and conspicuous members of the New World mammals. Today, the New World monkeys (classified as “Platyrrhini” in reference to their flat noses) are incredibly diverse, with 53 species in 5 families, including howler monkeys, spider monkeys, woolly monkeys, tamarins, marmosets, and many more. Where did they come from? We can start by tracing their history in the fossil record. The first New World monkey fossils were discovered by Carlos Ameghino in Patagonia, and described by his brother Florentino as Homunculus patagonicus in 1891. The name “Homunculus” (“little man”) is also a sly reference to old ideas about embryology. In the Middle Ages, naturalists and alchemists thought that our sperm or eggs actually contained a miniaturized human or “homunculus” inside, which grew larger as the embryo developed. It wasn’t until the invention of the microscope that scientists could see that sperm and egg cells did not contain tiny humans, but were simple cells that divided to form primitive balls of cells. Even today, the idea of a homunculus occurs widely in literature and science fiction. Ameghino’s fossil monkey Homunculus patagonicus consisted of a partial skull and jaws and some skeletal bones from the middle Miocene Santa Cruz beds of Patagonia, so it shows that New World monkeys were rapidly evolving by 15 m.y. ago. Since the discovery of Homunculus patagonicus, more and more platyrrhine fossils have been found in Central and South America, although these fossils are not particularly common since monkeys tend to live in tropical rainforests, where the potential for their bodies to be buried without being destroyed by decay or scavengers is not very high. For the longest time, the oldest known primate fossil in South Amerca was Branisella, from the upper Oligocene Salla beds in Bolivia. It was found by Bolivian paleontologist Leonardo Branisa, so when French paleontologist Robert Hoffstetter described it in 1969, he named it in honor of Branisa. Branisella has such primitive features that it cannot be assigned to any of the living families of platyrrhines, but might be ancestral to any of them. It is mostly known from teeth and jaws that show a lot of wear; these suggest that it had an abrasive diet. The small portion of skull that was found had a small eye socket, so it was probably a daytime primate, not a nocturnal creature that would have much larger eyeballs. Before Branisella, however, there was a big gap in the fossil record. It appeared that no primates lived in South America before 26 m.y. ago. Branisella was extremely similar to Proteopithecus, a very primitive primate from the late Eocene of Egypt, about 37 m.y. old. This suggested that New World monkeys came over from Africa some time between 26 and 37 m.y. ago, but when did they do it? And how? My friends and collaborators Dr. Ken Campbell of the Natural History Museum of Los Angeles County, and C. David Frailey of Johnson City College in Kansas, have been collecting in the headwaters of the Peruvian Amazon since the late 1970s. Among the amazing discoveries they have made were a series of tiny teeth found in late Eocene beds in Peru. Originally recovered in 2010, at first they were not recognized for what they were because they were so unusual and odd-looking. When primate experts saw the teeth, they recognized their similarities to New World monkeys right away. The fossils were finally published last month in Nature [paywall] after a five-year delay and named Perupithecus. They pushed the origins of New World monkeys back to at least 36 m.y. ago, so they are roughly the same age as their close relatives from the late Eocene of Egypt. So the time difference has vanished, but still this points to an amazing voyage to get descendants of Proteopithecus across the Atlantic Ocean about 36 m.y. ago. When I was a graduate student in paleontology, there were still scientists who could not accept this idea. They argued that New World monkeys were somehow descended from the last of the lemur-like primates that had once dominated the jungles of North America during the Paleocene and early Eocene. There were just three small problems with this: somehow they crossed from North America despite the evidence that the land bridge was absent and no other North American groups managed to cross. Second, none of the lemur-like primates were very close to any kind of monkey, and we knew of the early African monkey fossils which were much more similar to New World monkeys. Third, the lemur-like primates vanished from North America by the middle Eocene, and none were known from the late Eocene, so there were no primates in North America at the time monkeys supposedly headed south. (This problem was more acute when we thought the oldest South American primate was only 26 m.y. old; it’s not such a big deal now that they are 36 m.y. old). The last of those “North American origin” arguments has died out long ago, and now primatologists agree that New World monkeys came from Africa. New research on the molecular similarity between Old World monkeys and New World monkeys further confirms that they are close relatives, and never had much to do with lemurs or their ancestral lemur-like fossils. 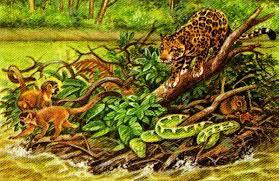 Rafts of floating vegetation might have carried numerous animals long distances. (Image courtesy D. Naish). Still, it seems amazing that monkeys could sail across the Atlantic Ocean, like the crew of “Gilligan’s Island” on a “three-hour tour” that ends up lasting forever. But there are several things to keep in mind. First of all, 37 m.y. ago the Atlantic Ocean was only about half as wide as it is now. Thanks to plate tectonics and seafloor spreading, the Atlantic Ocean gets about 6 cm wider every year, about the rate that your fingernails grow. This may not seem like much, but over 37 million years it really adds up. Today this distance is thousands of kilometers or miles, but back in the late Eocene, it was probably only 1500 km (900 miles). And there were islands along the way that might have served as stepping-stones for small animals to cross. Finally, we have seen just such examples of animals far out at sea being carried by rafts of floating vegetation, usually washed out into the ocean by huge river floods. Over 1200 species are thought to have used rafts to reach their present locations, mostly on remote islands. In 1955, scientists documented a mat of uprooted trees from the mainland that had floated the island of Anguilla in the Caribbean. A dozen green iguanas were witnessed swimming ashore to an island that previously had no iguanas. Marine organisms can get around this way, also. Tiny planktonic larvae can spread across huge distances, but they have other ways of getting around, including rafting. After the March 11, 2011 tsunami in Japan, a floating piece of Japanese dock drifted 8000 km (5000 miles) for over a year, and landed on June 5, 2012, on Agate Beach in Oregon, having crossed the entire Pacific Ocean with over two tons of its marine life intact and alive. They included mollusks, anemones, sponges, oysters, crabs, barnacles, worms, sea stars, mussels and sea urchins. There were also some serious invaders, such as European blue mussel (itself an invader of Japan), the Asian brown seaweed, an Asian shore crab and a Japanese sea star. These creatures were already implicated as potentially dangerous invasive species, but many others had never been seen before on U.S. shores. Finally, monkeys were not the only colonists to reach South America by rafting from Africa. It turns out that there are lots of animals that did the same thing: geckos, skinks, tortoises, the blind burrowing reptiles known as amphisbaenids, and even the peculiar birds known as hoatzins. Most impressive of all were the caviomorph rodents (capybaras, Guinea pigs, chinchillas, agoutis, cavies, nutrias, porcupines, and their kin), which are incredibly diverse in Latin America today. They too have their closest relatives in Africa (crested porcupines, naked mole rats, and many others), and their close relationship to African rodents has been confirmed by molecular biology. And in 2012, the fossil record of South American rodents was pushed back to 41 m.y. ago, making their arrival even more ancient than the oldest New World monkeys. How far was Southern Africa from Antarctica at this time? Wouldn’t a route from south Africa to Antarctica to the still connected South America result in an easier route? The climate was certainly warm enough at the time to allow mammals to survive on Antarctica, and plants as well. Thoughts? South America and Antarctica were still close, but Africa had pulled away from any other Gondwana continent by the mid-Cretaceous, at least 100 m.y. ago, so that doesn’t help. To use a more contemporary comparison, it’s presently around 600 miles from the coast of Ecuador to the Galápagos Islands. If the distance from Africa to the Americas in the Eocene was only 1.5 times that, it’s not impossible at all to envisage such a crossing. What would seem unlikely in a thousand years becomes inevitable in a million. What does molecular data show? Sorry, I was unclear. I meant as to timing of split between Old World snd New. Is it consistent with most recent fossil info? When I first heard of the raft theory I could not easily believe it. After I read Alan de Queiroz’s “The monkey’s voyage” I saw it as unavoidable. What did they eat? And what did they drink? It seems like rafting would take a very long time. I can understand marine life and even reptiles going without food and fresh water for a long time, but a warm-blooded primate would need food and fresh water frequently during the voyage. How did they manage that? As a grad student at CSU Fullerton in the 1960’s, I attended a seminar by Dr. Ira Wiggins on Galapagos Flora (Wiggins wrote the original treatise on Baja California flora), and he talked of watching huge mats of tropical vegetation leaving the South American coast from flooding rivers and moving out into the Pacific. At the time, I naively thought of a few animals balanced on a raft! Not so…these were acres of tropical forest that included whole micro-ecosystems, including soil that could hold water. So it is very possible that the same thing could occur on the rivers of Africa…and the distance 30-40mya is not that different from the 900 miles from SA to the Galapagos. Has there been enough genetic mapping done to determine how many founder events occurred? Are there several distinct lineages or are they all descendents of a single founding population? To what extent is the genetic diversity relationship of South American to African monkeys analogous to African and non African human populations?